We ran across this recipe last week watching the Deen brothers on Southern Fried Road Trip. They stopped by a cute little restaurant where one of the most popular items was a tomato pie. Now I have to admit, when I was growing up I was not a huge tomato fan. In the south, EVERYONE always had at least one tomato plant in their garden and tomatoes were a staple for quick sandwiches in the sweltering heat. Only over the past few years have I started learning to LOVE them. This recipe makes 8 ramekin-sized individual pies. In a food processor, add flour and salt and pulse quickly to mix. Add vegetable shortening and ice-cold butter and pulse until butter is pea-sized and just mixed into flour mixture. Slowly add iced water through feed tube of food processor on low speed, until mixture is combined into dough ball. Remove dough and make into ball on well-floured surface. Put dough in zip lock bag and store in refrigerator for 30 minutes. While dough chills, cut tomatoes into medium dices and add to large mixing bowl. 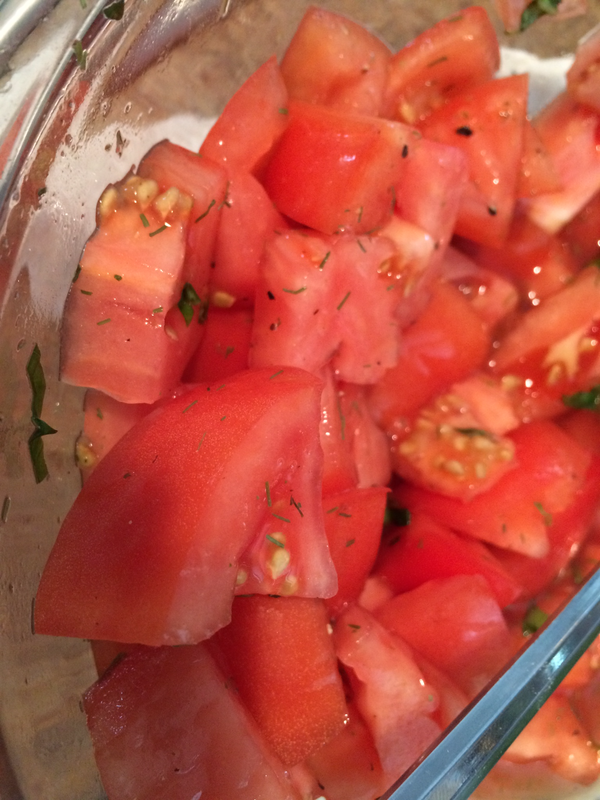 Add a healthy pinch of salt and fresh cracked pepper to tomatoes to taste. 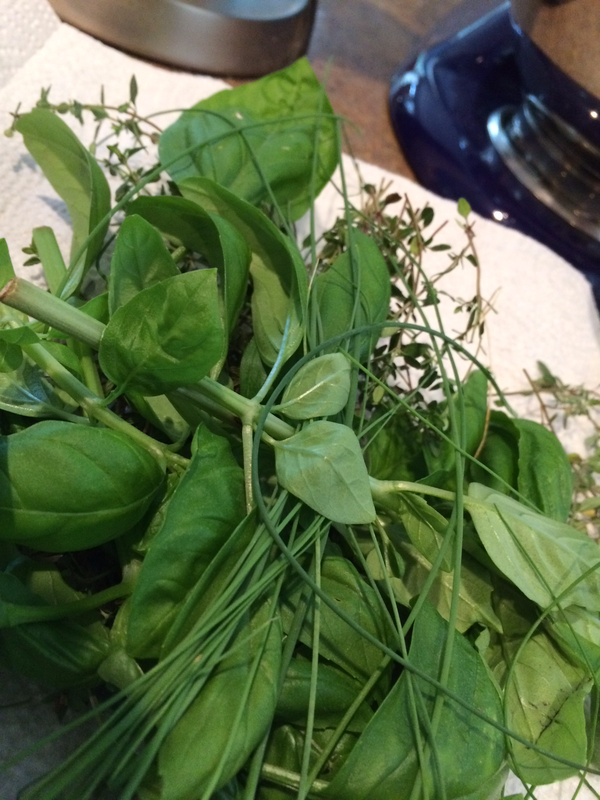 Roughly chop basil leaves, thyme sprigs and dill and add to tomato mixture, tossing gently. In another bowl, combine shredded cheese and mayonnaise. Give chives a rough chop and add to cheese mixture. 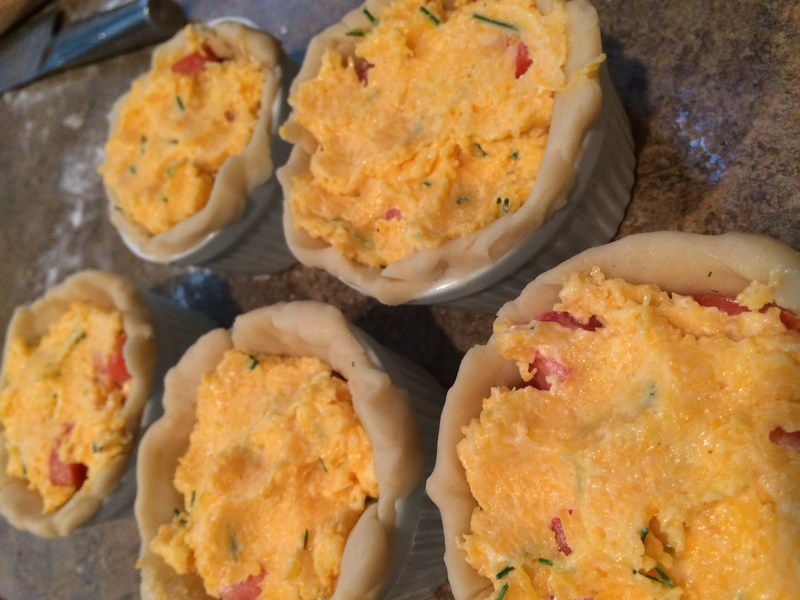 Roll out crust dough to about 1/4 inch thickness and cut into rough size of the ramekins. Top each filling with heaping Tbsp of cheese/mayo/onion mixture, spreading to cover tomatoes – finish off with fresh cracked pepper. Place ramekins onto sheet pan and put into 400-degree oven for 20 minutes, until crusts and cheese topping are lightly browned.